Bob Marley will always be seen not just as one of reggae's largest influences, but as one of the most influential figures in all of music. His way of life will also be continually admired, and his spirit will always live on. If you're a fan of Bob, this Playing Music From His Soul - Bob Marley Tapestry is a much-needed decoration for your dorm room. Tapestries for college capture a feel and uniqueness that regular posters can't always replicate. 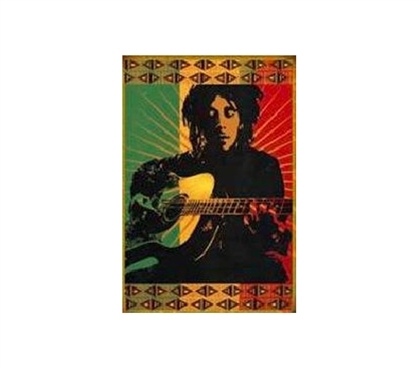 A cheap tapestry will certainly make your dorm room have more color and character, even if you're a more casual Bob Marley fan. Shopping for dorm decorations should be one of the best parts of college shopping. After all, you'll be purchasing the fun dorm stuff, the dorm items that make your dorm room yours and not just some other blank room. Bob Marley's colorful personality and soul mean he wouldn't approve of a bland, character-less living space. So don't let Bob down. Decorate your dorm room with a Bob Marley college tapestry and let his music live on.